With tinted Vaseline, who needs to splash out on lip gloss? What can I tell you about tinted Vaseline, aka Vaseline Rosy Lips? Just like regular Vaseline, it makes a bargain lip balm. 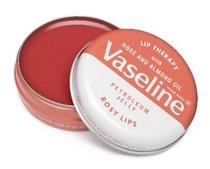 In the tin, the Vaseline is a rather alarming shade of hot pink (it’s pretty toned down in this picture). You will be reassured to note that on your lips, the rosy shade is far more “delicate”. A 20g tin costs just £1.69 from Boots. Compare that to £13.50 for a pot of Benefit lip tint! It’s glossy, rather than full on Juicy Tubes gloopy. The balm includes rose and almond oil, which smells sweet. I like the retro tin. Tinted Vaseline sounds amazing! I don’t wear tinted lip color myself, but that is a very thrifty find. Is it available in the United States? I don’t know if you can get this in the U.S. – if you can’t, I shall be utterly outraged!